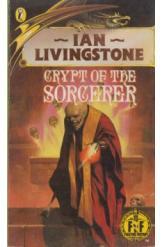 Crypt of the Sorcerer by Ian Livingston, Sci Fi. Book is in good condition, all pages intact. The evil sorcerer Razaak has returned from the dead, and the only one who can stop his conquest of the land of Allansia is YOU! With two dice, a pencil, and an eraser, the reader can assume the role of the hero of Allansia and play through this adventure. Part of the Fighting Fantasy series.